A pottery painting birthday party at Iris & Dora is the perfect way to celebrate your child’s special day. It is simple, fun and most importantly, stress free. All parties include up to 1 1/2 hours of studio time, all pottery, under-glaze, over-glazing & firing. This also includes 1/2 hour in the middle of the party for food/snacks as we find the children need a break halfway through. 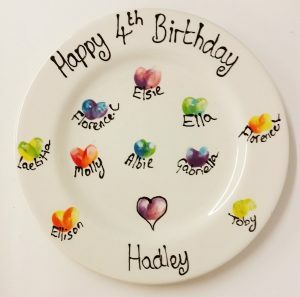 Childrens parties include a party keepsake plate for the birthday child. Fun Figurine Parties (Blue Zone) cost £15 per person, each child gets to choose from our collection of smaller figurines including cats, dogs, dragons, snails, penguins, pirates, rabbits, racing cars, foxes, squirrels, fish, turtles, unicorns, teddy bears and lots lots more. Fab Figurines Parties (Green Zone) cost £18 per person, each child gets to choose from our collection of larger figurines, boxes, mugs and lots lots more. Money Box Parties cost £20 per person, each child chooses from our selection of amazing money boxes, including footballs, monster trucks, princesses, castles, whales, dolphins, frogs, piggies, horses, Octopus, burger, stegosaurus and so many more. Freestyle Parties allow you to set your own budget. We charge a studio fee of £3 per person to cover the hire of the studio/staff/birthday keepsake, on top of which you pay the normal price of each piece chosen on the day, this allows your guests to pick from any of our 400 different pieces. 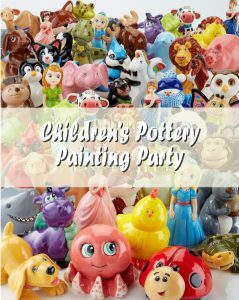 Pottery painting parties are suitable for children from 4 years old to adult, but parties under 7 years will need you to bring a few extra adult helpers to give them a hand. The 1 1/2 hours includes time for you to serve snacks, cake and drinks and you are welcome to decorate the studio with banners, balloons etc if required. Just call us on 721 375 or email lydia@irisanddora.gg to check availability.